The new show that will unite Guillermo del Toro, Netflix, and DreamWorks Animation dropped its first image today. When the show was announced in January, Trollhunters was described as taking place in "a new, fantastical world wrapped around two best friends who make a startling discovery beneath their hometown." Based on the above image (and the title, obviously), that discovery is gonna involve some very large, very hairy, but actually kinda friendly-seeming beasts. Of course, we already knew that — since it's based on the illustrated novel of the same name that del Toro penned with Daniel Kraus. And the property has been in play since even before the book was released last year. 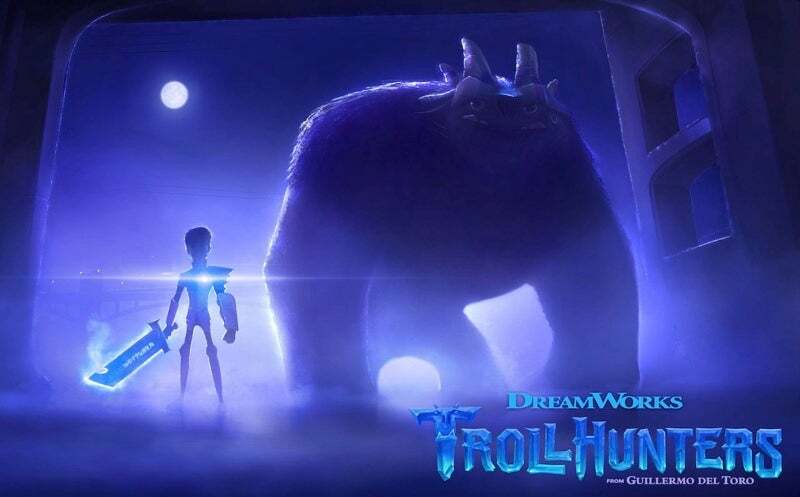 Back in 2010, DreamWorks was planning to make Trollhunters into a 3D animated movie before shifting gears and teaming with Netflix for a series — which will debut later this year — instead.